Elegantly display your favorite potted plants in two places using these Panacea Forged Three-Tier Plant Stands. This set of two stands is perfect for holding several plants at once, and for flanking an entryway or lining part of your deck or balcony. Each hardy, steel stand has three rectangular tiers, increasing in depth toward the base for a cascading effect. Large, square gridwork forms each hardy shelf, allowing air to circulate around the plants, while scroll detailing on the top and sides of each unit provide contrast. The black color on the stands ensures a timeless look, and each piece perfectly rests on a level surface indoors or outside. Made from lasting steel and powder coated, these items will surely remain beautiful and usable for several seasons. Provide your favorite potted plants lovely display spots on these Forged Three-Tier Plant Stands. Some assembly required. 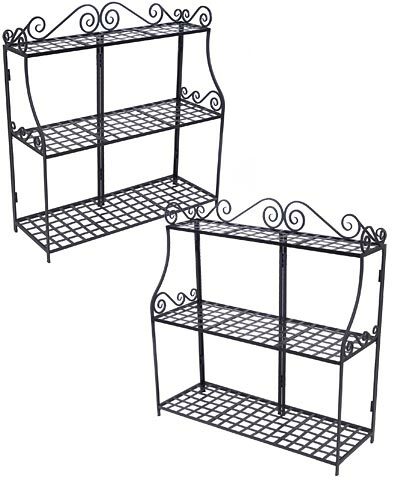 Note: This case pack includes 2 of the Panacea Forged Three-Tier Plant Stands, Black, 41.5"H.